One of the three collective movements, travers develops your horse's strength and flexibility while teaching him to carry more weight in his haunches. In shoulder-in, the horse's forehand is shifted toward the inside of the arena while the haunches stay on the rail. In travers, we do the opposite: The horse's forehand stays on the rail while the haunches shift toward the inside of the arena. Another difference is that in shoulder-in the horse's legs travel on THREE tracks (because the outside hind leg steps into the same track as the inside foreleg), while in travers, the horse's legs travel on FOUR tracks. Haunches-in is called haunches-in because you shift the horses haunches toward the inside of the arena. ("Haunches-in" is a translation of the French term "croupe en dedans". It is also referred to as "tête au mur", which means "head to the wall"). You can see why from the diagram. The diagram shows the essentials of the travers (haunches-in) movement. (Photo Credit: USDF. org) Imagine you are walking your horse on the rail, forming two tracks. Her rights legs are on the right track (near the rail) and her left legs are on the left track (the second from the right in this diagram). In the diagram, the horse's hind legs have shifted over to the left toward the inside of the arena, each traveling on its own brand-new track. The horse's neck and body bend around the rider's inside leg at a gentle 30 degree angle. As in shoulder-in, it is sometimes easier for both rider and horse to learn this movement by riding it out of a circle. As you approach the rail in your circle, half halt to collect your horse a bit more, then ride down the long side of the arena. As you ride, you will try to maintain the bend from the circle you just rode. Shift your horse's haunches off the rail toward the inside of the arena, gently squeeze your inside rein, and keep a firm outside rein so your horse doesn't "jackknife" her neck to the inside. Then--and this is most important--weight your inside seat bone and apply your inside leg to drive your horse forward down the arena. Your leg will be most effective if you apply gentle pressure just as your horse's inside hind begins to rise. Your horse's gait will feel like her legs are freely swinging sideways under her belly as her body moves forward along the rail. ​Here is another video of Horse & Rider's Daniel Timson giving tips on how to perfect the travers movement. 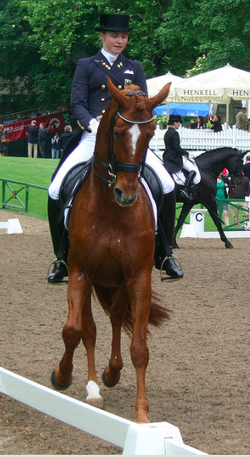 In this excellent Dressage Today article, Janet Foy (FEI 4* and USEF “S” dressage judge, and “R” sport horse breed judge) provided some additional insights in how she judges the quality of the movement, and the common errors she sees. First, she points out that the rider should "Think of this as a stretching exercise, much as you would do if you wanted to touch your toes. You would not succeed the first day. However, you would need to stretch several times a day, every day to succeed. It is always a good idea to go back to the more simple the head- to-the-wall leg-yield exercise, if you have difficulty getting the haunches to react enough." I could not agree more. Often, riders think of collective movements as "tricks" that the horse must learn rather than as muscle training. They become frustrated when the horse doesn't respond well to the aids, and out comes the whip! If you are tempted to do that, consider how you would feel if someone tapped you on the bottom when you "refused" to stretch down enough to place your palms flat on the floor. Wouldn't really help you develop the stretch, but certainly would make you dislike the one holding the whip. She also points out that "... in the finished product, your horse’s shoulders and your shoulders are perpendicular to the long side and your outside hip is slightly back with weight in the direction of the bend. A correct rider position will create a lot of stretch through the outside of your body, too." "The finished movement will have the rider using the outside leg to displace the haunches and then the inside leg to ride the horse forward and create cadence. Don’t drive the horse with your outside leg for the entire movement. This will cause many problems in the half pass." Finally, she points out that, "The most common mistake I see is a rider who does not keep the horse’s forehand moving straight down the track. Riders often turn the horse’s shoulders toward the rail, struggling to displace the hindquarters. They also twist their upper bodies, sitting to the outside in an attempt to create more displacement of the haunches with the outside leg." This is excellent advice. I also strongly recommend Foy's book Dressage for the Not So Perfect Horse. It is a treasure trove of training advice gold-nuggets.